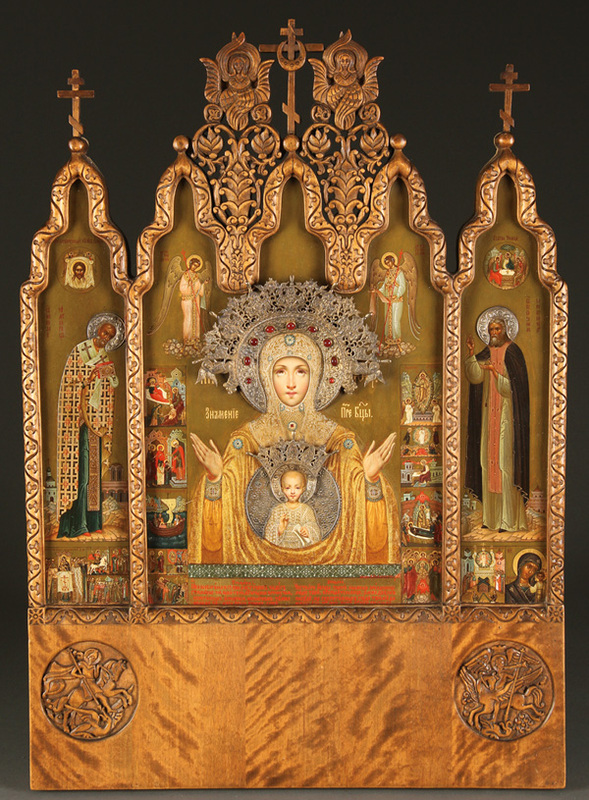 FABULOUS RUSSIAN ICON TRIPTYCH, SIGNED, CIRCA 1912 The central reserve displaying a finely painted image of The Serafimo-Ponetaevskaya Sign Mother of God, characteristically painted with a gem and pearl encrusted veil. The Christ Child as well as the head of the Virgin, encircled with ornate silver repousse haloes, the Virgin’s halo embellished with cabochons. Both with likely latter added hallmarks for St. Petersburg, and with likely latter added Cyrillic maker's mark FABERGE beneath the Imperial Warrant and workmaster's initials TR presumably for Phillip Theodor Ringe. Below the Virgin are inscribed the standard troparion (left) and kontakion (right) celebrating icons of the “Sign”. And further still lower right the icon is signed in Cyrillic “Painted by N. Emelianov”. Above the Virgin on either side are painted two full length images identified by inscriptions as Angels of the Lord. To the Virgin’s right (viewers left) a vertical panel divided into six sections each depicting a church feast day or other related event. From top to bottom they are; The Birth of the Mother of God, The Entrance of the Mother of God Into the Temple, The Translation of the Relics of Saint Alexander Nevsky from Vladimir to St. Petersburg, Saints Peter and Paul, The Appearance of the Wonderworking Icon of Kazan, and The Translation of the Relics of Saint Theodore Stratelates. To the Virgin’s left (viewers right) a similar vertical panel divided into five sections depicting the following iconographical subjects; The Resurrection, The Transfiguration, The Apostle and Evangelist Saint Matthew, The Dormition, and The Assembly of the Archangel Michael. Further out, the left wing depicts a finely painted full length image of Saint Nicholas whose head is encircled by a silver repousse halo stamped with the workmasters initials TR and who stands beneath an image identified by the Slavonic inscription as the Not-By-Hand-Made Image of Our Lord. Below Saint Nicholas is a reserve divided into four sections depicting various subjects. Clockwise from upper left they are; The Transferring of the Vladimir Mother of God Icon, Saint George, Saints Konstantin and Helen, and the Translation of the Relics of Saint Nicholas. The right wing depicts a finely painted full length image of Saint Seraphim of Sarov whose head is also encircled by a silver repousse halo stamped with the workmaster initials TR and who stands beneath an image of The Old Testament Trinity. Below Saint Seraphim a reserve divided into two sections depicts the following subjects; The Discovery of the True and Life-Giving Cross and an image of The Kazan Mother of God. Each shaped panel separately painted and set into the ornately carved one piece frame displaying an eight-sided cross finial atop the left and right wings and the central section surmounted by a similar cross flanked by a pair of six-winged Seraphim. The wide lower margin with two medallions carved in high relief and depicting Saint George (left) and The Archangel Michael (right). 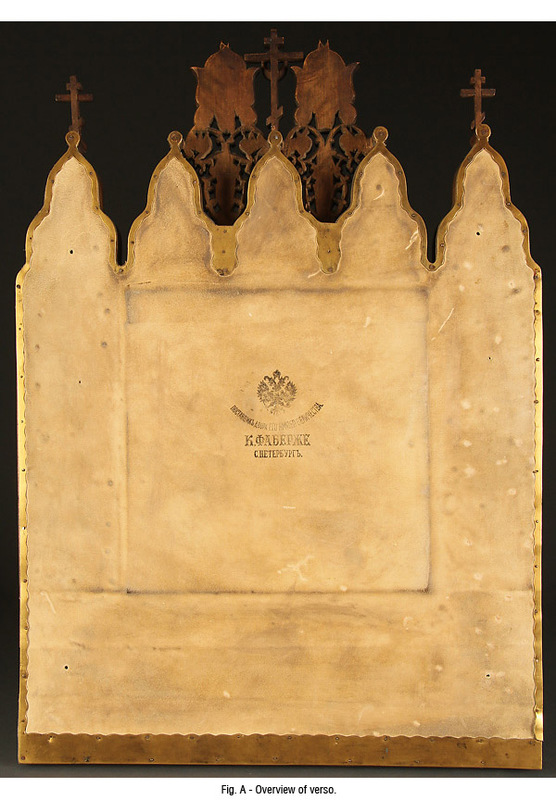 The verso of carved frame lined with brass edging around the border and the entire back covered in kid leather and stamped in Cyrillic K.FABERGE beneath the Imperial Warrant and with St. Petersburg address (whether this stamp is indigenous or not is unknown. Height 23.3 inches (59.4cm). Width 16.4 inches (41.5cm). Colonel Dmitrii Nikolaivich Loman, circa 1912, presumably a gift from Empress Alexandra Feodorovna. With Bowater Gallery, London, where acquired by Mrs. Harold Leather of Hamilton, Ontario, Canada, accompanied by original receipt of purchase dated August 10, 1970. 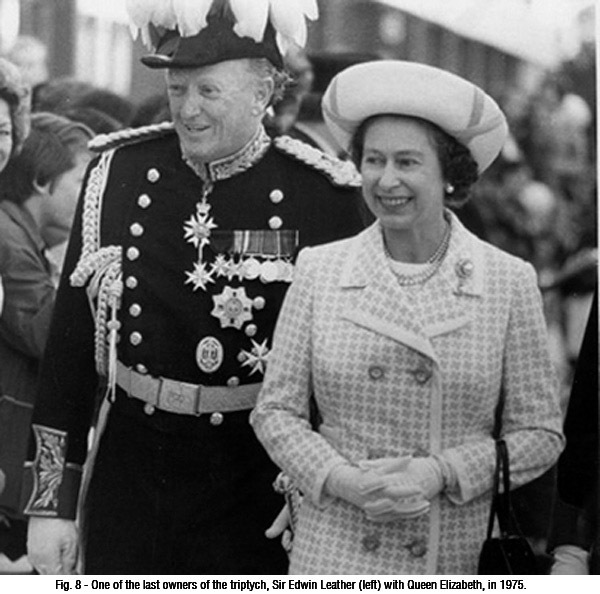 Thence by descent to her son, Sir Edwin Leather (1919-2005) former Governor of Bermuda, and acquired by the present owner from the estate of Sir Edwin Leather. The Mother of God of the Sign icon known as the Serafimo-Ponetaevskaya was imbued with particular significance for Tsar Nicholas II and his wife Alexandra Feodorovna. As the last icon of this iconographic type to be declared miracle-working in Russia (1885), it became for the Imperial couple a symbol of Holy Rus reborn and triumphant in the modern age, and a direct link to the miraculous powers and protection of Saint Serafim of Sarov, to whom the Empress Alexandra was especially drawn. When the couple attended the celebrations marking the canonization of the Nizhnii Novgorod saint in 1903, the Ponetaevskaya icon was one of three venerated for their connection to Serafim’s life and work. The Empress was given a copy to mark the occasion and this icon accompanied her until her final days and death in Ekaterinburg in 1918. 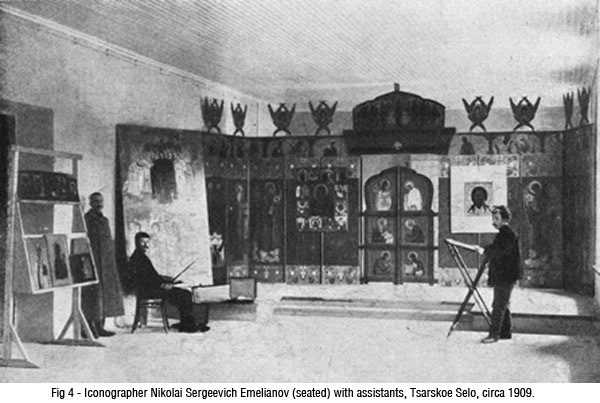 The Ponetaevskaya icon was particularly associated with Tsarskoe Selo, which in 1901 became the official Imperial residence and from 1909 was the site of the Fedorovsky Gorodok, an elaborate complex intended to recreate the spirit and culture of an idealized Russian past in a modernized idiom. It is with Colonel Dmitrii Loman, the driving force behind the construction and conception of the Fedorovsky Gorodok and a trusted member of the Imperial family’s inner circle, that the offered lot is associated. The icon’s name derives from the Serafimo-Ponetaevskaya convent, established in 1864 in memory of Saint Serafim (1754/9 - 1833), whose hermitage was located at nearby Sarov. 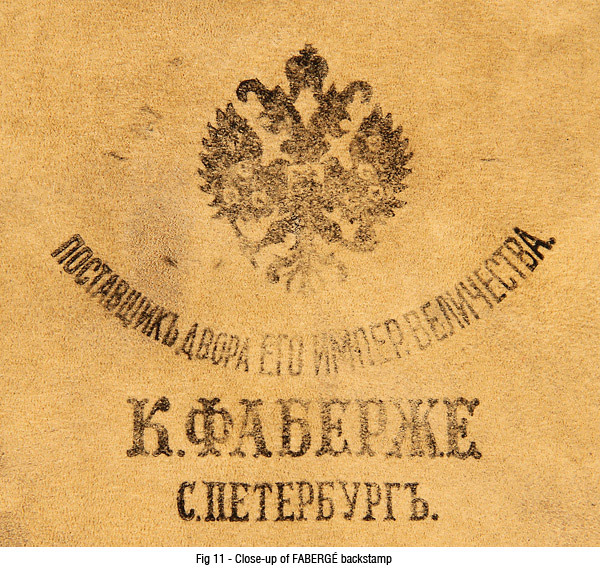 The convent was famous for its icon painting workshops, and in 1879, a novice named Klavdia Voiloshnikovna made a copy of an icon of the Sign that had been acquired from the artist Pavel Sorokin who oversaw the painting studio. In addition to the canonical features of Sign icons - the half-length figure of the Mother of God with her hands raised in prayer and the Christ Child encircled by a nimbus within Her womb - the icon that Voiloshnikovna copied had several distinctive features. The Mother of God’s eyes are lifted to heaven and a pearl and gem encrusted veil sheathes her head and shoulders, imparting to her face a teardrop-shaped contour. The faces are rendered in the painterly style popular in the nineteenth century and have a certain sentimental sweetness. On May 14, 1885 the icon performed the first of many miracles and by the end of the year was officially proclaimed miracle-working by the Holy Synod. In 1909 an exact copy of the icon arrived at Tsarskoe Selo as a gift from the Abbess of the Ponetaevskaya convent. 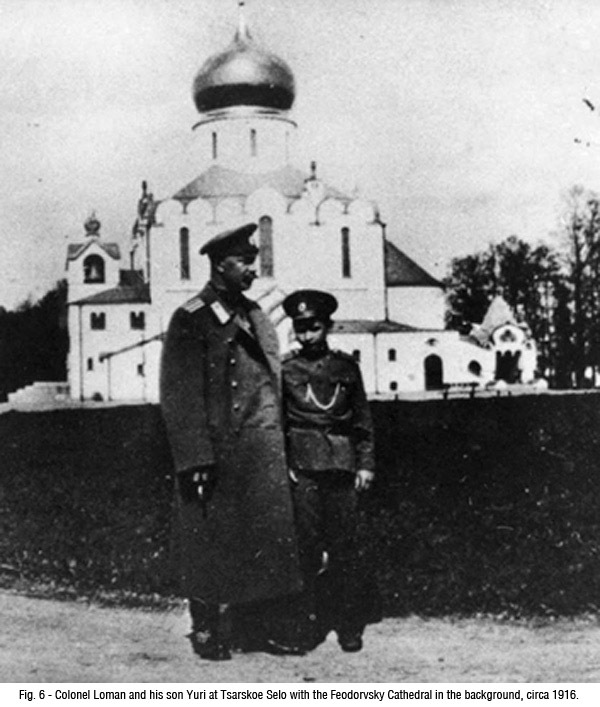 That same year, Tsar Nicholas II approved construction of a temporary church to serve the devotional needs of His Majesty’s Own Regiment, who were permanently stationed there. Dedicated to Saint Serafim of Sarov, the church was an experiment in resurrecting an idealized Russian past. It was appointed with an iconostasis designed by Prince Mikhail Putyatin (see fig. #3 & #4) and filled with icons painted by noted iconographer Nikolai Emelianov executed in the 17th century style. The Ponetaevskaya icon occupied a place of honor in the church, along with relics associated with Saint Serafim. At the same time Nicholas and Alexander gave permission and funds to build a permanent cathedral on the grounds of the Alexander Palace at Tsarkoe Selo, where their family might worship surrounded by their most devoted troops as well as their favorite sacred images. Consecrated in 1912, the cathedral contained two churches. In the upper church dedicated to the Feodorovskaya Mother of God icon, a five-tiered iconostasis was installed, filled with new icons painted by Emelianov in the same 17th century style and lavishly adorned with silver basma. On the lower level, space was carved out for a crypt church and it was here that the temporary church’s altar, icons, relics and fixtures were transferred. To the Ponetaevskaya icon was added a copy of the Umilenie Mother of God that had been Saint Serafim’s personal icon, together with an icon of the saint himself. A second Ponetaevskaya icon hung nearby in the empress’s own private chapel, donated by the empress’s sister, Grand Duchess Elizaveta Feodorovna in 1912 and adorned with a sumptuous silver oklad and costly embroidered veil (Fig.1). The offered triptych of the Ponetaevskaya Mother of God with Saints Nicholas and Serafim can be securely traced to Dmitrii Loman (1868-1918), a Colonel in His Majesty’s Own Regiment, whose energy and organizational talents made him an indispensable and sympathetic aide to the Imperial couple and was by all accounts very close to the Empress, who was the Godmother of Loman’s son, Yuri. 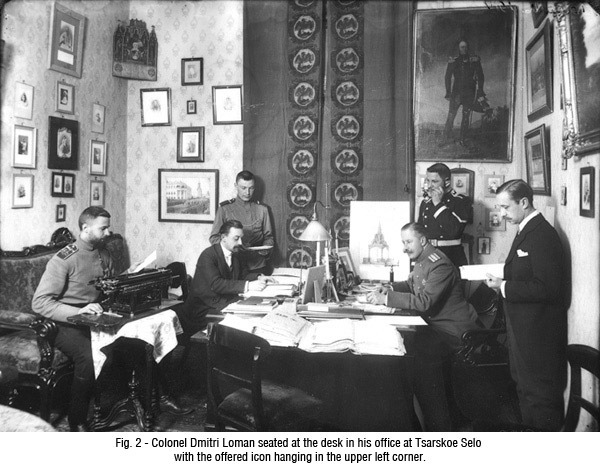 A contemporary photograph dated to 1914 shows the icon hanging in the upper corner of Loman’s office located in the refectory at Tsarskoe Selo (Fig.2). Colonel Loman served in countless capacities that reflected the Emperor and Empress’ trust. In addition to being churchwarden of the cathedral, during WWI he served as the Empress’ representative on the Tsarskoe Selo Military Hospital Train No. 143 and similar trains under the protection of the grand duchesses. 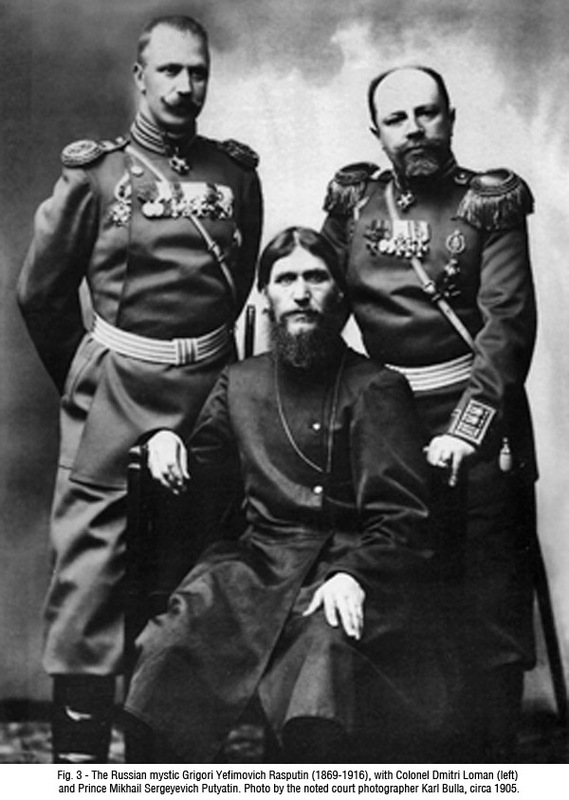 He was also on friendly terms with Grigorii Rasputin (Fig.3) who was a frequent visitor and was one of the few people actually present at his burial. Loman’s great passion was the preservation of early Russian art, music, and popular culture, and his collections of liturgical and folk art were intended to serve as inspiration for the revival of a single national style in all facets of contemporary life. In 1915, he was instrumental in creating the Society for the Renaissance of Artistic Rus, a group that included the leading artists and architects working in a neo-Russian style. The society’s goals included the study and preservation of Russian antiquities, the revival of pre-Petrine aesthetic traditions adapted to contemporary conditions, publishing textbooks on Russian art for schools, and restoring the purity of the Russian language. The complex of buildings that grew up around the Feodorovsky Cathedral, the Feodorovsky Gorodok, was to be a prototype for the realization of these goals on a national scale. The elegantly elongated figures of the two attendant saints - the tsar’s name saint Nicholas and Saint Serafim himself - and the miniature painting of the marginal scenes of festivals and saints are subtly adapted to the distinctly modern features of the Ponetaevskaya Mother of God. An exceptionally rich visual rhythm is created by the variations in scale and size of the scenes that flank that central image and create a continuous horizontal band along the lower edge. 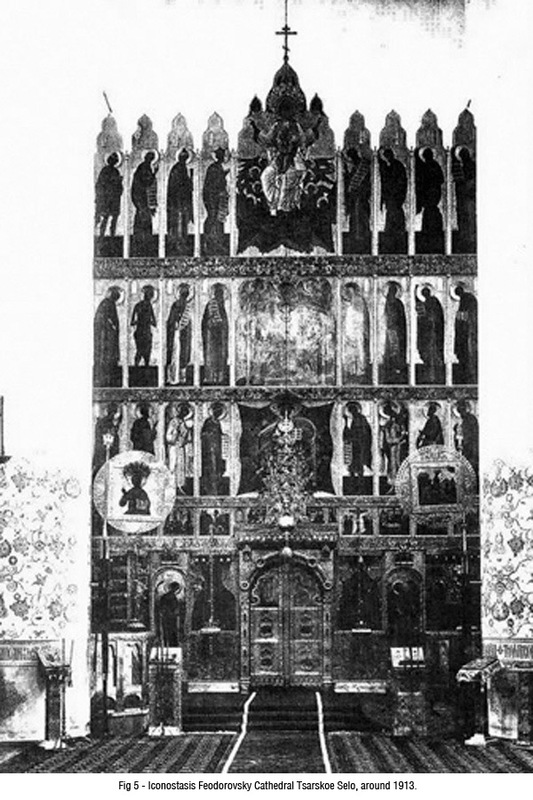 The three panels are set within a carved wooden framework that echoes the elongated gables of the iconostasis designed by Vladimir Pokrovsky for the upper church (Fig 5.). The carved relief roundels on the lower margin reference the mosaic icons of Saint George and Saint Michael that Emelianov designed to mark the north and south entrances into the cathedral (St. George appropriately designated the officers’ entrance). Reflected in the cabochon-studded haloes is the rich intricacy of 17th century devotional icons that established the aesthetic ideal espoused by enthusiasts like Prince Shirinsky-Shikhmatov and Loman himself. The carving borrows some of the stylized folk motifs from the furnishings designed for the cathedral by Nikolai Bartram and executed in the workshops of the Moscow Zemstvo at Sergiev Posad. Here too a balance is sought between the lushly ornamented upper half in the neo-Russian style and the neoclassical simplicity of the lower section. Clearly, the triptych is a testament to Loman’s deeply held conviction - one he shared with the Imperial couple - that a renaissance of Old Russian values in contemporary life was a goal within reach. In the absence of a presentation plaque or other documentation we can only speculate as to its origins. It would certainly have been a fitting gift of appreciation and remembrance from the Empress for whom Loman had proved so indispensable. It is displayed in Loman’s office near an assortment of personal photographs depicting Tsar Nicholas II and the Empress of the type known to have been given by the royal couple to those whom they held in high esteem. However, perhaps the best clue as to who might have commissioned this icon rests in the fact that the triptych was displayed in the office of dutiful royal confidant and administrator Dmitrii Loman, it is fair to presume that the offered lot was indeed a gift from Nicholas and Alexandra to Loman most likely upon the completion of the cathedral in the fall of 1913 which Loman oversaw, including the task of primary fundraiser. After decades of decay and destruction, in 2009 a concerted restoration of the Feodorovsky Cathedral at Tsarskoe Selo was undertaken and the iconostasis reconstructed on the basis of several surviving icons by Emelianov. Loman’s son Yuri (1906-1988) survived the times or terror, successfully adjusted to communist rule and towards the end of his life penned a biography, “Memories of the Empress’ Godson”. The Society for the Renaissance of Artistic Rus of which Loman was instrumental, ceased its activities in October 1917. Loman perished (was shot) during the terror of 1918 and by 1928 the old icons from the Feodorovsky Cathedral had been dispersed, some made their way to the Russian Museum, while others, including some painted by Emelianov went to the State Museum of the History of Religion. Others, like the offered lot, thankfully found safe haven elsewhere and after decades of silently preaching in places far removed from the splendor of Tsarskoe Selo, are now being enjoyed by a new generation of enthusiasts who have come to appreciate the true geniuses of those artisans who created a unique Russian style that has now risen from the ash heap of history to reign again in splendor. All items are sold “AS IS” and there will be no returns based on condition. The items sold are often of considerable age and will exhibit wear, usage and damage often not listed in the catalog entry. The absence of condition remarks in the catalog entry DOES NOT mean the item is in perfect condition. Prospective buyers are in ALL CASES responsible for determining the physical condition of lots. No employee or agent of Jackson's International Auctioneers and Appraisers is authorized to make on our behalf or on that of the consignor any representation or warranty, oral or written, with respect to any property. Therefore, if a prospective bidder has not examined the property to their satisfaction before the sale, or his/her agent has not inspected the property, Jackson's recommends that they not bid on the property. All dimensions are approximate. The condition of frames is not guaranteed.